The rare Umber Lobber subspecies has been added. 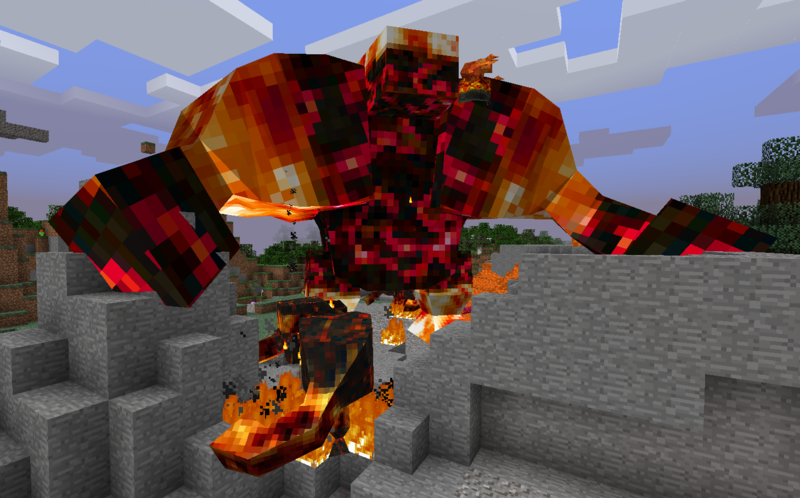 It is gigantic in size a will constantly hurl balls of lava around randomly as well as melt certain nearby blocks into lava. Changes have been made to fix the spawning of various Shadow Mobs, because of this, the config will automatically reset, to avoid this change the version number value in lycanitesmobs-version.cfg. It is then recommend to delete the shadowmobs-spawning.cfg config so that a fresh copy is generated with the fixed spawn settings. The Familiar GUI now has a health/respawn bar that shows for the selected familiar. Fixed a bug with familiars where changing worlds in single player would cause familiars to vanish completely until game restart. Deactivating and reactivating a familiar should fix this now if it happens. Grues should now show naturally underground amongst Chupacabras and Shades. Most Shadow Mobs will no also naturally spawn in The End too! Beware! Mounted entities should no longer take suffocation damage, though the sound and animation will still play. Invisible entities can no longer be set as an attack target unless the attacking entity has Night Vision. ============================================================ Lycanites Mobs Update: The Soulstone - Version 1.11.0.1 for Minecraft 1.7.10 Configs older than 1.11.0.1 will be reset. ============================================================ -------------------- New Features: -------------------- The rare Umber Lobber subspecies has been added. It is gigantic in size a will constantly hurl balls of lava around randomly as well as melt certain nearby blocks into lava. -------------------- Config Changes: -------------------- Changes have been made to fix the spawning of various Shadow Mobs, because of this, the config will automatically reset, to avoid this change the version number value in lycanitesmobs-version.cfg. It is then recommend to delete the shadowmobs-spawning.cfg config so that a fresh copy is generated with the fixed spawn settings. -------------------- Changes: -------------------- The Familiar GUI now has a health/respawn bar that shows for the selected familiar. Improved the Barghest model. -------------------- Minor Fixes: -------------------- Fixed a bug with familiars where changing worlds in single player would cause familiars to vanish completely until game restart. Deactivating and reactivating a familiar should fix this now if it happens. Grues should now show naturally underground amongst Chupacabras and Shades. Most Shadow Mobs will no also naturally spawn in The End too! Beware! Mounted entities should no longer take suffocation damage, though the sound and animation will still play. Invisible entities can no longer be set as an attack target unless the attacking entity has Night Vision.